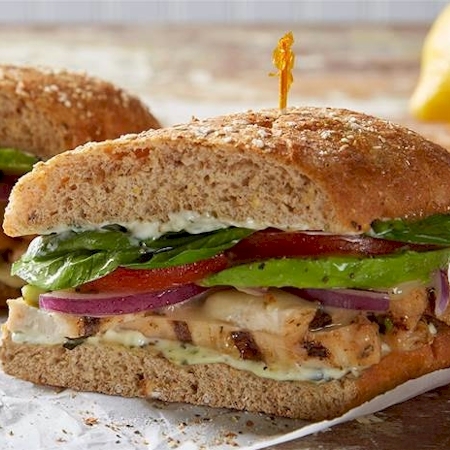 McAlister's is a fast-casual chain known for its hearty-portioned sandwiches, giant loaded spuds, soups, salads, desserts and McAlister's Famous Sweet Tea. Start with Just-a-spud with sour cream on the side and add the toppings of your choosing. Choose from Country Potato, Broccoli and Cheese, Chicken Tortilla, or Fire Roasted Vegetable. Black Angus roast beef and Swiss Cheese on a baguette, served au jus. classic mashed potatoes and homestyle “come-back gravy.” Smooth, creamy and full of flavor. Tortilla chips served with RO*TEL® cheese sauce and sliced jalepeño peppers. Chili (or Veggie Chili), RO*TEL® cheese sauce, black olives, diced tomatoes, jalapeños, green onions, cheddar-jack cheese, guacamole and sour cream on a bed of tortilla chips. Hot and satisfying, simmered slowly just for you. Our chili is chunky with beef, beef and more beef to give it a hearty flavor. A hearty, meatless, all-bean chili that has all the seasoning you love. Black Forest Ham, salami, olive salad, house roasted multicolored peppers, provolone, red onions, crisp cucumbers, and tomatoes. Chef's dressing selection: Olive Oil & Balsamic Vinaigrette. Chili (or Veggie Chili), tortilla chips, cheddar-jack cheese, jalapeños, red onions, tomatoes, guacamole and sour cream. Romaine, Parmesan and croutons tossed in Caesar dressing. Smoked turkey, Black Forest ham, bacon, sharp cheddar, Swiss, spring mix, tomatoes, McAlister’s Honey Mustard™ and mayo on wheat. Our King Club takes our signature McAlister’s Club and doubles the meat, cheese, vegetables, mayo and the flavor. We put all that on Country White bread and serve it up fresh. Butterball™ smoked turkey, Black Forest ham, applewood smoked bacon, sharp cheddar, Swiss, lettuce, tomatoes, orange cranberry sauce and lite mayo on sliced wheat bread. Grilled chicken breast, applewood smoked bacon, sharp cheddar, Swiss, lettuce, tomatoes, McAlister's Honey Mustard™ and mayo on sliced wheat bread. Black Angus roast beef, applewood smoked bacon, sharp cheddar, Swiss, red onions, lettuce, tomatoes, horseradish sauce and mayo on sliced wheat bread. 8 oz. of corned beef, sauerkraut, melted Swiss and our signature Thousand Island dressing on toasted marbled rye. Piled high with 10 oz. of corned beef and pastrami, melted Swiss and spicy brown mustard on toasted marbled rye. Black Angus roast beef, Black Forest ham, Butterball™ smoked turkey, provolone, lettuce, tomatoes, mayo and spicy brown mustard on a toasted 6” wheat hoagie. A half pound of Black Angus roast beef served open-face on a toasted baguette with gravy and cheddar-jack cheese. Butterball™ smoked turkey, applewood smoked bacon, Gorgonzola cheese, guacamole, lettuce, tomatoes, mayo and ranch dressing on ciabatta. Butterball™ smoked turkey, applewood smoked bacon and pepper jack cheese topped with McAlister's Honey Mustard™ on ciabatta bread. Butterball™ smoked turkey, coleslaw, melted Swiss and our signature Thousand Island dressing on toasted marbled rye. Butterball™ smoked turkey, applewood smoked bacon, pepper jack cheese, guacamole and chipotle ranch. Topped with lettuce and tomato on a baguette. Black Angus roast beef with sharp cheddar, caramelized onions and horseradish sauce on ciabatta bread. Sliced, grilled chicken breast topped with guacamole, fire-roasted corn & poblano pepper relish, pepper jack cheese and chipotle ranch sauce on a ciabatta roll. Sliced, grilled chicken breast, Romaine, Caesar dressing and Parmesan cheese in a wheat wrap. Grilled chicken breast, lettuce, tomatoes, Swiss and McAlister's Honey Mustard™ on a toasted croissant. Sliced, grilled chicken breast with spicy sweet chipotle peach sauce and sharp cheddar cheese on a ciabatta roll. Dressed with leaf lettuce and tomatoes on a toasted croissant. *This product contains pecans. Black Forest ham, Swiss, dijonnaise, tomatoes and dill pickle slices on ciabatta bread. A grown-up grilled cheese. Provolone, Swiss, American, and Parmesan cheese with fresh tomato slices on a ciabatta roll. Covered with chili (or veggie chili), cheddar-jack cheese and sliced jalapeños. Topped with spinach, steamed broccoli, red onions, house roasted multicolored peppers and finished with our RO*TEL cheese sauce. Finely cut cabbage with a flavorful creamy sauce. This lightly seasoned broccoli isn’t just good for you, it’s just plain good. Southern style potato salad with chunky potatoes blanketed and our creamy mustard and egg dressing. Fresh greens, cheddar-jack cheese, tomatoes, cucumbers and croutons with your choice of dressing. Choose from Original Sea Salt Spud Chips, BBQ Spud Chips, Salt & Vinegar Spud Chips, Jalapeño Spud Chips, Nacho Cheese Doritos, Cheetos, or Harvest SunChips Original. Kids’ go-to favorite served the McAlister’s way on crunchy French bread topped with tomato sauce and cheddar-jack cheese. All natural chicken tossed with fresh, steamed broccoli and cheddar-jack cheese. Choose Strawberry, Wildberry or Plain.